One of my favorite things to wear in my closet is a maxi dress. They are by far the easiest and most stylish item to grab on the go. I always find myself slipping into my maxi dresses when I am too tired to really think about an outfit. Truthfully, I hate thinking too hard about what I wear. When I do I get flustered and end up not feeling confident. The days I hardly do anything and wear something based on instinct are the days I get the most compliments. I am excited to wear them into the fall with long sweaters and boots. Agreed on everything you said up there! Trying too hard definitely shows. I feel the most confident is something that just looks and feels effortless. Maxis are definitely one of my favorites to slip on! WOW I love it with the jacket!! Pretty. Love the jacket and the nails too. 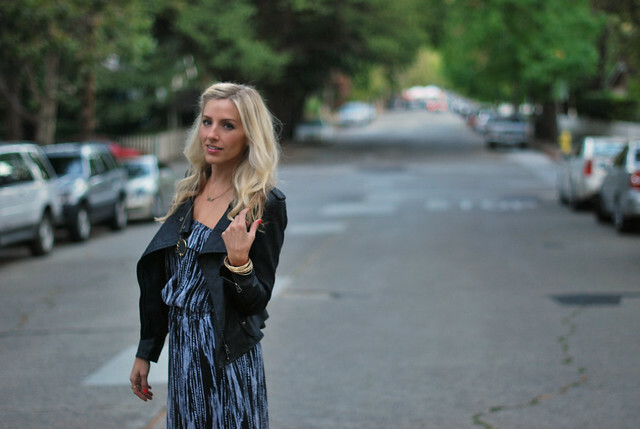 Love the pretty dress with the tuff girl leather jacket! :) That HOH necklace is definitely on top of my wishlist!!!!! I'm a huge fan of maxi dresses anyway, but totally love how you wore it with the leather jacket!! effortlessly chic!!! :D great maxi dress!! You look awesome! Great dress! wow, this dress is just amazing! i love maxi dresses too- so glad there are so many to choose from last season and this season. You look so beautiful in the last picture!!! Great maxi! :) Those colors look great on you! I love how you did your hair -and- I love the jacket paired w/ it! I think the jacket is my favorite part of the outfit. It really ties it all together. love the maxi dress! I think you have inspired me to get mine out of the closet and make it work for the early fall wardrobe! LOve the dress & jacket combo. love this look - you look gorgeous! your hair looks fabulous and that jacket looks perfect with the maxi! that last pic of you is gorgeeeeeooouuusss!!!! pretty pretty lady! I totally love it with the blazer! You are beautiful! i wrote about it in my own blog, and would love to hear your two-cents. lovely maxi, and those chunky wedges are beauts! The jacket makes this outfit for me. Very cute paired w/ the jacket! That dress is perfect!!! Hugs! the jacket makes the outfit really perfect! forever21 has a bunch of maxis right now... i was super tempted to get at least one, but i feel like im way too short :/ i mean i wore one in a post, but i seriously am dragging fabric on the floor when i wear it. h&m also has a great leopard print maxi... hmmm maybe i just need to find huge platforms! I also am a huge fan of strapless maxis - I think they have such an elegant relaxed feel! I love long dresses too! Great look! I am loving those clogs too! You always pick the perfect settings for your photos! We should have a blogger meet up sometime! I am always looking for an excuse to get banana cupcakes at Icing on the Cake! What you said is totally true. I always feel uncomfortable and not true to myself when I try to hard - it's like I try to mimic someone else's style rather than my own. The maxi dress (and the shoes!) look fab, and the colours will fit right into fall! Maxis are one of my favorites aswell. Feel free to stop by sometime. You look amazing! I'm flying up to L.A. tomorrow, yay! pretty!! love the shoes. i love maxi dresses too. im going to miss summer in NJ and wearing them !! You look so beautiful in that maxi dress! They are so comfy to wear. Ugh, I feel you, I had the hardest time getting dressed this morning. Unfortunately, I did not have a maxi dress to throw on since I don't own one because they make me look short and stout. You look lovely, blue might be your color! Great dress! Maxi dresses are one of my favorites too, and I can't wait to transition mine into fall with some creative layering. love your dress and the necklace! pretty maxi! and I just read the above comment--boo to that semi bitchy comment. Perhaps all bloggers who have a love for fashion and food are all alike then. I heart you! LOVE this dress -- and it looks great with the jacket! this is totally adorable.